Entering your favorite musical restaurant, you may now find the perfect after-dinner delight: Oliver Schmitt aka Sounds Of Revolution proudly presents “Clicks & Glitches 3?, part three of the amazing and highly anticipated micro sample series. If you’re sick of predictable, lifeless beats, this is the antidote! 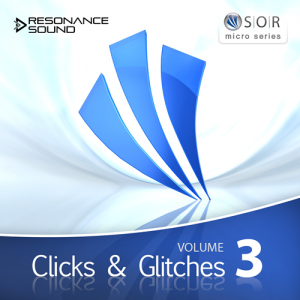 Clicks & Glitches Vol.3 is especially tasty for all who love to add a darker edge to technoid tunes, with preeeetty subby knocks, resonant clicks, intensely fx-mangled percussion and simply a huge overall groove that makes you get creative in no-time! Producers of techno, minimal, electro, tech-house and other “techy” styles of music will get the most mileage out of this pack, but also any electronic style looking to add some unusual, attention-grabbing sounds to their grooves will find lots inspiration here. The loops are commonly produced with 127bpm and are available in the popular sampler formats. ALL Demo Samples are included in the pack.